After Eddie Brock (Tom Hardy) is taken over by an alien symbiote, there’s soon a firefight against a number of soldiers. In the form of Venom, heads soon roll. Some, even, are eaten. Transforming back into human form, Brock quizzically asks, “Did you eat that guy’s head?” That’s as deep as Venom gets. Brock is quickly established as a decent human being. He helps the homeless. As an investigative journalist, he’s taken down corruption. And yet when it comes to being infected by an alien monster that eats people, he’s cool with all the death. At times, Brock even likes it. Venom doesn’t have depth. That’s its sin. Morality in such far-fetched relationship isn’t discussed; it’s tossed aside so this movie can segue quicker into its next bombastic visual effect scene. 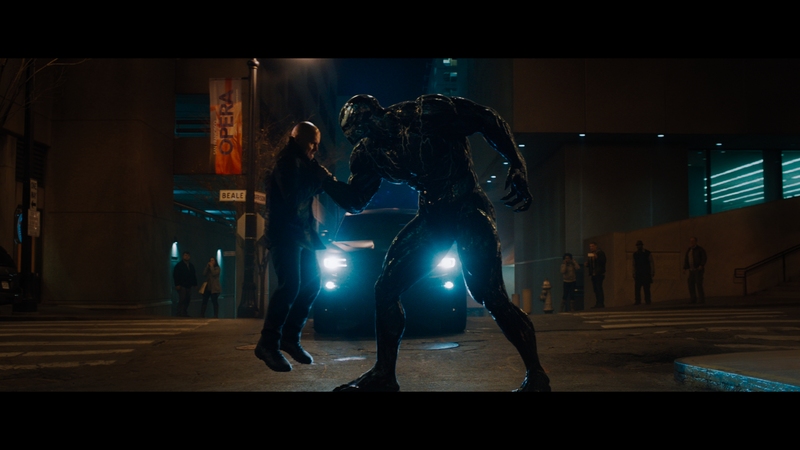 The context comic book movies provide, particularly the rest of Marvel’s output, evaporates in minutes through Venom. 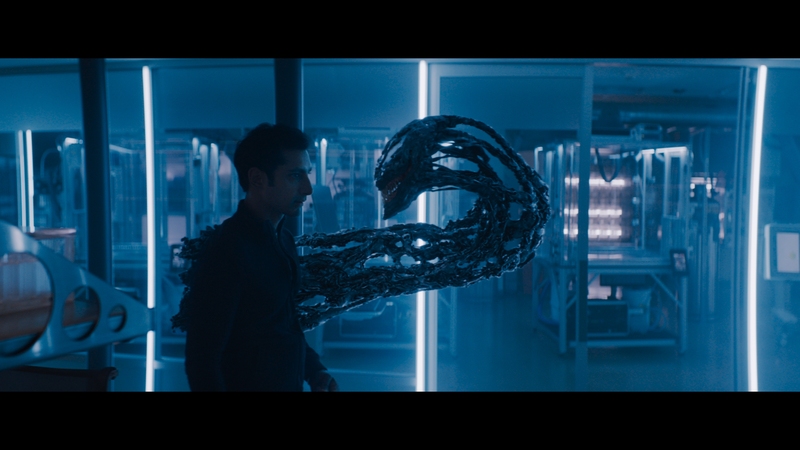 In the beginning, there’s the villain, a thinly disguised Elon Musk-like billionaire Carlton Drake (Riz Ahmed) seeking to enrich his bank account via space travel. Brock’s journalism pokes at his corruption. Later, Drake begins killing people when experimenting with the space-born goop. Seems wrong, but then Venom/Brock seem content with doing the same to their own end, so the vapidity of this material is apparent. Capitalizing “Anti-hero” is a lazy method shielding Venom from its grand faults. If nothing else, it’s a well dressed film. Using Venom’s abilities during a motorcycle chase gives the scene a creative energy. As an anti-hero, Venom’s plasticene, Stretch Armstrong routine enables some fun destruction and last second saves. By the time two of these creatures end up entangled with one another, it’s sheer mayhem with an artificial digital sheen typical of such blockbusters. Tom Hardy does what he can with the material, developing Brock as a homely, dressed down, depressed San Francisco citizen, nourished primarily by tater tots. He looks the part, even if lean characterization is all Venom will allow. That goes for the total too – Venom’s ambitions come from a place of exploitation, seeking to milk the superhero trend without ever understanding the central reason for its success. Instead of depth, it’s a misread, assuming all Venom needs is a gooey monster wrecking people. It’s the equivalent of making an X-Men feature without civil rights subtext. In its attempt, Venom takes superhero cinema back to a time when adults viewed them as aimless, garbage feeding fodder. In this case, those complaints were justified. As a best guess, it seems black levels keep at a certain brightness as to not lose Venom in the shadows. When Venom appears, he does so with a marvelous, dense black, different from the slightly pale backgrounds. That robs Venom’s presentation of depth, left unassisted by the weary, over-bright contrast. That’s not a knock against the stable HDR pass. Highlights of San Francisco at night stick out. That goes for neon hanging on businesses or aerial establishing shots of the city. Dynamic contrast comes out in full there. Keeping with the aesthetic, color remains flat too, rendered with cooler tones. Primaries flatten toward blue with ghostly flesh tones. The few bits of warmth come from light sources, and even those lean toward neutrality. Subjective qualities of the true-to-the-source palette aside, the lack of density does keep a consistent noise at bay. A coarseness to the imagery keeps detail behind a lightly filtered look. Mostly, that’s unobtrusive. Texture still jumps forward. Sharpness keeps a level of admirable stability. Venom himself looks spectacular, with his molten-like skin defined. His opposition Riot features a metallic sheen, a further challenge this disc handles without issue. 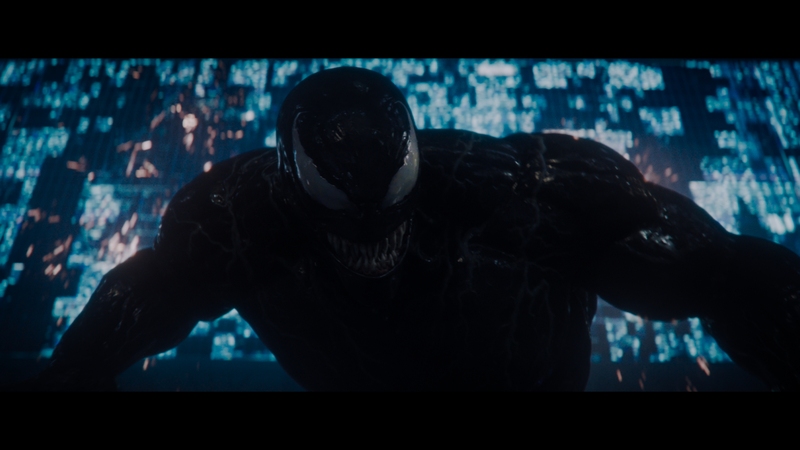 The lackluster contrast of Venom shows on the Blu-ray edition. Noise seeps into the lesser shadows, and the Blu-ray needs to work overtime to keep up. It does generally speaking, if succumbing to problem areas. Sharpness pleases, offering clean resolution to the rugged imagery. Textural qualities come through. Facial detail holds against some clipping, and Venom looks wonderful. Churning in bass, Atmos work strikes early with a crashing spaceship. Spectacularly tight LFE produces a sizable rumble, matching the scale of the ensuing fireball. 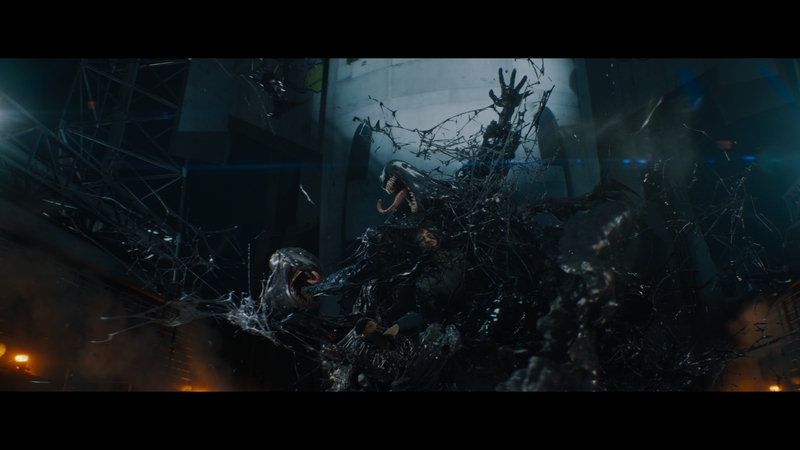 That energy transfers into each action sequence, with potent gunfire and Venom’s own weight slamming down. Even his voice generates low-end bite, exaggerating the evil. Surrounds play nice too, at their peak during a battle against drones. Subwoofer support adds thrust to the ensuing explosions, but not lost is the whip-around effect as the vehicles pan. Transitions make fantastic, speedy moves between speakers, seamless in their motion. Gunfire spreads around too, and transitions with the camera. The final brawl muddies a touch as things get busy, but there’s plenty of energy. 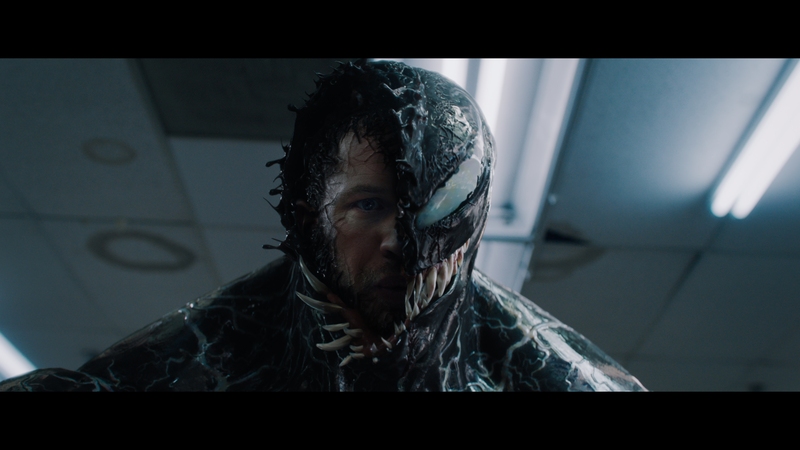 Only on the Blu-ray, Venom Mode includes a number of pop-up featurettes while you watch. Continuing in the bonus menu, extended/deleted scenes run five minutes total. From Symbiote to the Screen provides the general production rundown for 20-minutes. Looking deeper at the character than the movie, The Anti-Hero discusses tone and heroism for ten minutes. 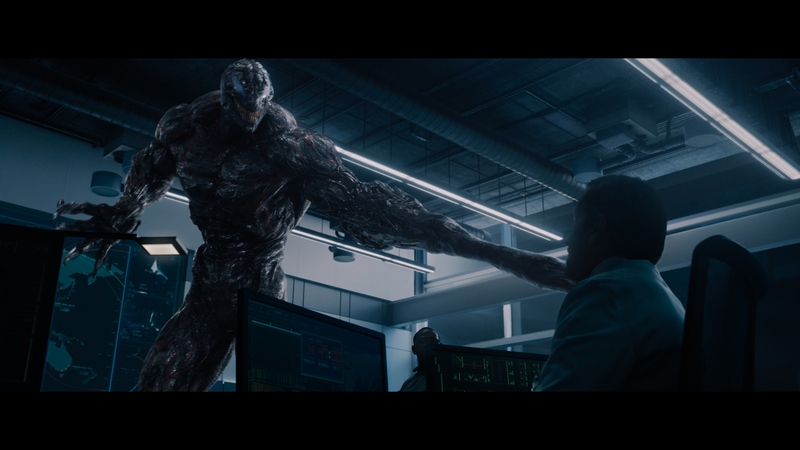 Director Ruben Fleischer is praised for nine minutes in Venom Vision. The look of the title character comes in focus via Designing Venom. A look at in-movie references for fans runs a few minutes, followed by music videos. The only bonus shared by the UHD is a promo for Into the Spider-Verse. In theaters, this showed after the obscenely long 20-minute end credits. There’s a lot to consider when it comes to Venom as a character, none of which this tired superhero dud is interested in exploring.